Iowa is playing host to a national event focused on bird hunting, wildlife conservation and dog training. Mick Klemesrud is a spokesperson for the Iowa Department of Natural Resources, a sponsor of the 2015 National Pheasant Fest and Quail Classic — this Friday through Sunday at the Iowa Events Center in Des Moines. Klemesrud notes two days coincide with the State Wrestling Tournament. “We’ll get a lot of the different vendors from the across the country that are involved in pheasant and dog training. They expect about 25,000 (people to attend) so it would be nice if we had a little bit more than that with the additional people in town,” Klemesrud says. 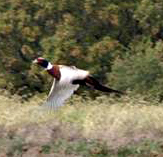 The annual Pheasants Forever event began in 2005 and was previously hosted by Iowa in 2007 and 2010. Klemesrud says pheasants may not be as plentiful in Iowa as decades ago, but they’re making a comeback. “We are not to the glory years that we were in the 1990s, but we’ve had a few upticks in our pheasant numbers and we expect to have good survival into next year,” Klemesrud says. “So, we’re going build on year-over-year pheasant numbers and if we have a good spring, we’re going to have more pheasants than even last year.” At this weekend’s event, landowners can meet with DNR conservation officers to discuss ways they can help improve upland bird habitat. Klemesrud says the event will also include a Youth Village. “In the Youth Village, we’ll have a lot of different entertainment and games for the kids. Our officers will have some air rifle ranges, some 3D archery and we’ll have a snowmobile simulator,” Klemesrud says. Daily admission to Pheasant Fest is $10 for adults, $5 for children 6-16, while children 5 and under get in free. For a complete schedule of events visit www.pheasantfest.org .